DDCA bowling average winners, Slocs represnting Spolly. 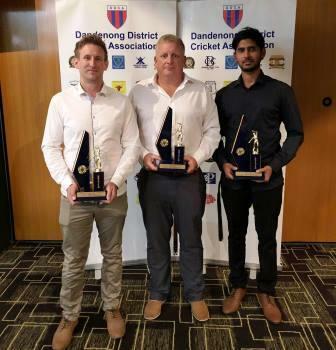 The Bloods bowlers were well represented at the DDCA Senior Presentation nIght. Steven Spoljaric won the the Turf One bowling average. His 26 wickets in the home and away season came at an average of 9.73. Damain Stoter - Rainer was given the Turf Three bowling gong, with his 20 wickets coming at a touch over 9 runs apiece. To round the night off, Anthony Perera saluted in Turf Five, taking 20 scalps at 8.7.